This weekend Kim and I went on a trip through Banff and Jasper National Parks with my parents (I'm still in Red Deer visiting them as I write this). In addition to seeing various water falls, we also went up on the Columbia Ice Fields and on the Banff and Jasper Gondolas. 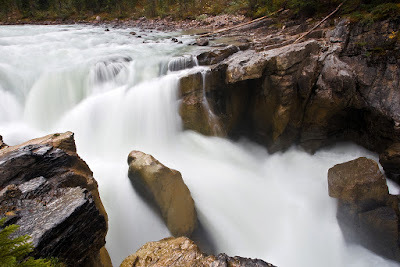 This was taken on the last day during a quick stop at the Sunwapta Falls and Gorge. I had neglected to pack my tripod, so I had to rely on resting the camera at an odd angle on the top of the protective barrier. I think that without LiveView, it would have taken much longer to shoot this image (I managed to get this one my first try). Technical Specs: Canon 1D3, 17-40 @ 19mm, f/22, 1s, ISO 100.